This article is a short summary of Fire Emblem: Three Houses. Fire Emblem: Three Houses is an upcoming main entry in the Fire Emblem series, slated for release on the Nintendo Switch in July 2019. This game will mark the first title in the series to be released for a home console since Fire Emblem: Radiant Dawn for the Wii. Three Houses is set on the continent of Fódlan, which is the home of three kingdoms: the Adrestian Empire, the Kingdom of Faerghus, and the Leicester Alliance. While these kingdoms were engulfed in war long ago, they now exist in relative harmony with one another. The player starts as an avatar character, who is a member of their father Jeralt's mercenary group. After a strange incident, the group arrives at the Gerrag Mach Monestary, operated by the Church of Seiros, who offer the avatar a teaching position at the Officer's Academy. The avatar also begins to see visions of a mysterious girl named Sothis. 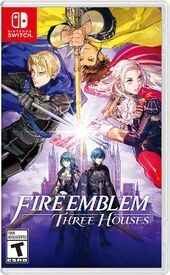 Three Houses retains the grid-based strategy gameplay of past Fire Emblem titles, in which players direct their units into battle against enemies. Unique to this game is that each unit fights alongside a small squad of soldiers that assist them in battle. Unlike in Fire Emblem Fates and Fire Emblem Echoes: Shadows of Valentia, weapons once again have a limited number of uses. Similar to Shadows of Valentia, Three Houses features segments in which the player character can freely travel across an overworld and interact with other characters. A main series Fire Emblem title was originally announced to be in development for the Nintendo Switch during the Fire Emblem Direct in January 2017, with a planned release in 2018. The first trailer for the game was shown at E3 2018, during which it was announced that the game would release in spring 2019. The game was later shown again during the Nintendo Direct on February 13, 2019, which revealed the final release date of July 26, delayed once again from the spring release window. According to Fire Emblem Echoes: Shadows of Valentia director Kenta Nakanishi, developing a game for the Nintendo Switch home console has allowed the team to "offer a completely different Fire Emblem, breathing life into our characters like never before." ↑ Nintendo Direct - 02.13.19. Nintendo. Retrieved February 13, 2019. ↑ 2.0 2.1 2.2 2.3 Fire Emblem: Three Houses - Nintendo Direct 2.13.2019 - Nintendo Switch. Nintendo (YouTube; February 13, 2019). Retrieved February 13, 2019. ↑ 3.0 3.1 3.2 3.3 3.4 Fire Emblem Three Houses - Official Game Trailer - Nintendo E3 2018. Nintendo (YouTube; June 12, 2018). Retrieved October 13, 2018. ↑ 4.0 4.1 Fire Emblem Direct 2.18.2017. Nintendo (YouTube; January 18, 2017). Retrieved February 20, 2017. ↑ Fire Emblem: Three Houses revealed for Nintendo Switch. RPG Site (June 12, 2018). Retrieved October 14, 2018). ↑ Fire Emblem Echoes : Shadows of Valentia - Rencontre avec les pères du jeu. jeuxvideo.com (May 18, 2017). Retrieved May 28, 2017. ↑ Switch will allow for “a completely different Fire Emblem,” will breathe life into characters “like never before”. Nintendo Everything (May 28, 2017). Retrieved May 28, 2017. This page was last edited on 8 March 2019, at 22:57.